Dishing up Season 5 in 3 hot DVDs! Dudes! Your order for hot and fresh kung-fu adventures is ready. 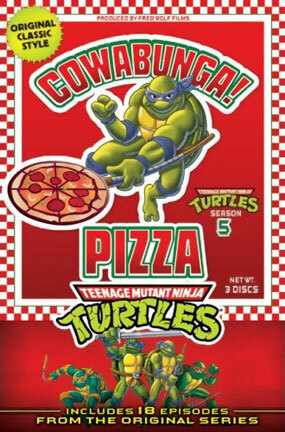 In 18 wicked episodes from the original series, Leonardo, Michaelangelo, Raphael, and Donatello deliver totally radical mutant action right to your door – and all the tasty extras you want are included. Cowabunga! Any way you slice it, their way of saving the day is gnarly.